The youngest special force of the services, Garud is a force multiplier raised with the intention of providing versatile military capability specific to the Indian Air force. Raised in the year 2003, the strength of the force is speculated upon. However,it is estimated that the strength hovers around 1000-1500 personnel. Raised and trained on the lines of the Para commandos of the army and MARCOS of the navy, Garuds have been able to carve a niche for themselves within a short period in operational specific tasks. Their role is diverse and largely specific to the air force. During hostilities, Garuds undertake combat rescue, supression of enemy air defence and other missions in support of air operations. Their peace time role can be looked under counter terrorism, anti hijacking, aid during natural calamities and military tasks in the interest of the nation. Garuds have been deployed to Congo as a part of the UN peace keeping contingent. Operating alongside the special forces of the Army in Jammu and Kashmir provide them the much needed operational exposure. Towards this purpose, teams from the flights are attached to army SF units. Once a recruit completes training and meets the tough physical standards, he is absorbed into the Commando force and is retained in this stream throughout his stint in the IAF. Whereever he is posted in the IAF, he will be part of a Garud Unit. This approach ensures that the Commando Force retains its highly trained men for the complete duration of their career with the IAF. The first batch of Officers for the Garuds were volunteers from the Cadets of the Ground Duty Officers Coure being trained at the Air Force Academy Dundigal. These officers on sucessful completion had been absorbed into the Garud Force and will be permanently assigned to the force till the point they reach senior ranks and go for higher postings. This officer has removed all of his force identification badges and titles. However the velcro patches can be seen. The initial phase is conducted at the Garud Regimental Training Centre located at Hindan, near New Delhi. The first batch of 100 recruits were arrived from the No.1 Airmen Training Center at Belgaum , Karnataka. The three month probation filters out those who would go into the next phase. The attrition rate is very high. The subsequent phase on special operations training is imparted by the Special group of the Special Frontier Force, the army, NSG and the paramilitary forces. A few officers have also been trained by foreign militaries like that of the United States of America. Those who qualify, proceed to the Parachute Training School (PTS) at Agra to complete the basic airborne phase. The remainder of the phases concentrates on niche fields like jungle and snow survival, demolition etc. The Garuds are organised into a 'Flights' , roughly the equivalent of 'Company' in an Infantry Batallion. Each flight will be under the command of an officer of Flt Lt rank. The force will be organised into fifteen flights with a total strength of 1080 soldiers. The entire force is currently under the command of a Wing Commander rank officer. Unlike their counterparts from the navy MARCOS and Army Para-Commandos who sport maroon berets, Garuds are distinguished by the Black berets on a disrupted pattern uniform. They sport the operational paratroopers brevet on the right breast.The formation ensignia is worn on the left shoulder. 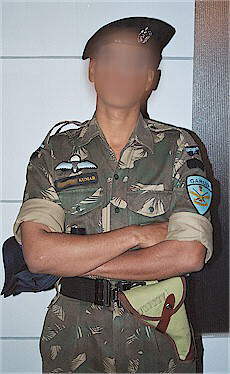 The Garuds are also entitled to wear 'IAF GARUD' titles on the sleeves. All Garuds sport the 9mm pistol as personal armament. 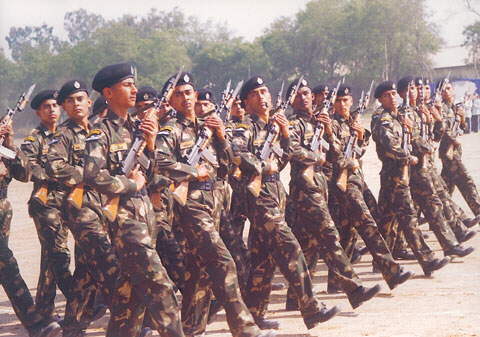 Most of the airmen are issued with the INSAS rifle, as observed during Aero India 2005.